Following the Divine Liturgy, the community of Saint Spyridon will celebrate a Memorial Service for the beloved Metropolitan Philotheos of Meloa, one year after his repose in the Lord. Metropolitan Philotheos of Meloa and Exarch of Isavria, served the Church for 67 years, 57 of which he served in the United States at the Greek Orthodox Archdiocese. He was born in Constantinople (Istanbul, Turkey), Sept. 1, 1924, to George and Lambrini Karamitsos. He received his primary education at the Holy Trinity and Zografion Schools in Constantinople. The outbreak of World War II interrupted his education. After the end of the war he went to Greece in 1949 to continue his education. He was awarded a scholarship by the Ecclesiastical School of Corinth and graduated in 1954. In 1959 he graduated from the University of Athens Theological School with a degree in sacred theology. In July 1950 he was ordained a deacon by Bishop Alexios of Evripos in Athens, Greece. For the next six years, he served as deacon at the parish of St. Artemios in Athens and then was assigned as a deacon of the Cathedral in Athens where he served until 1960. During this time he also officiated at worship services in the Chapel of the Royal Palace, alternating with another deacon. In 1960, he came to the United States at the invitation of Archbishop Iakovos and served as his deacon until 1961, when he was ordained to the holy priesthood at the Holy Cross Chapel in Brookline, Mass. He was assigned to serve the Annunciation Church in Scranton, Pa., until 1965. He was then transferred to New York City to undertake pastoral duties at St. Eleftherios Church in Manhattan and teach at the parish’s parochial school. He was ordained a bishop in June 1971 and served as an auxiliary bishop to the Archbishop until July 1997. 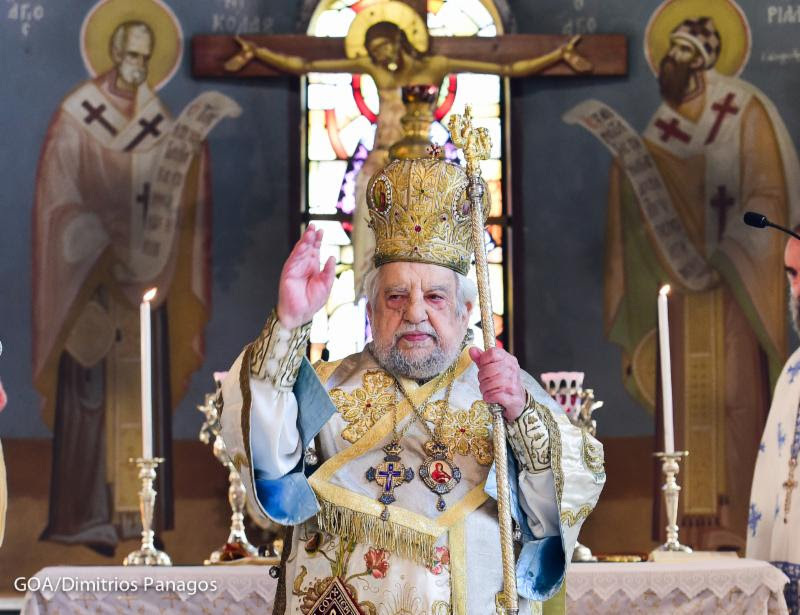 His retirement did not prevent him from continuing to serve the Church, assisting and celebrating the Divine Liturgy in parishes around the New York Metropolitan area. On July 9, 2015 he was elevated by the Holy and Sacred Synod of the Ecumenical Patriarchate to the rank of Metropolitan of Meloa and Exarch of Isavria. Metropolitan Philotheos is survived by his two sisters Elisavet Karamitsou and Maria Manesis and her family. Previous articleΟι λουφατζήδες της Ελλάδας!